These tendencies make Karwachauth, a day of the year where married women fast for the health of their husbands from sun rise until they see the moon, particularly challenging for me. You can read the folklore behind Karwachauth here. R’s family celebrates Karwachauth and so, dutifully albeit happily, I follow along. R, realizing that fasting is no easy feat for me, kindly fasts with me. We’ll break our fast tonight when we see the moon and after I hear the “Karwachauth story” from R’s mom. Ideally, we would have broken our fast with a nice, home cooked desi meal – creamy, spicy sabji, something with paneer, raita, hot rotis (mmmmm) but cooking dinner for a Friday dinner is made impossible by the billable requirements embraced by law firms. 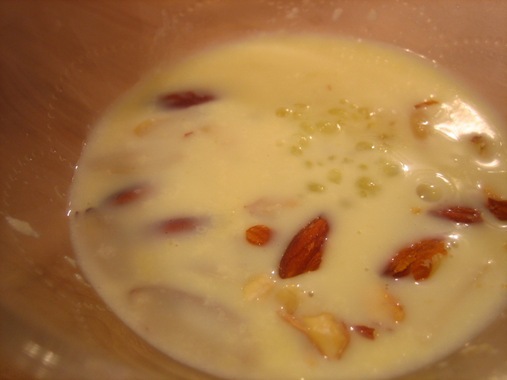 Instead, I made almond payasam, similar to North Indian kheer, last night so we’ll break our fast together with that and then go out for Mexican…how’s that for modern?! This was the first Indian sweet I’ve ever made, and it was shockingly simple. The recipe, as relayed to me by my mom and dad with both of them correcting one another’s technique, is provided below. Dry roast the tapioca for about five minutes – it should not brown but should just get very hot to the touch. Separately dry roast the almonds. Boil the tapioca in 1 1/2 cups water in a nonstick pan until the tapioca pearls become translucent. Add 2-3 cups of milk, a few strands of saffron and almonds. Stir in the sugar. Cook on medium-low heat and bring to a boil. Continue to cook on medium-low heat for about 15 minutes. Depending on how much of a sweet tooth you have, you may want to add more sugar. For those who are vegan or lactose intolerant, you could try this with almond milk which would be a tasty substitute. I searched for tapioca payasam and your site was the 4th result down. Pretty funny. Very small world. That’s funny…are you making payasam? Hi Nithya! Just wanted to tell you that yours is the first almond payasam I’ve come across. Our Sri Lankan one seems to have things like cashews, plump golden raisins, tapioca, vermicelli and we seem to substitute evaporated milk for milk. Or my aunties did anyway. Love your site. I’ve made Kenyan chapattis for dinner and now I’ll whip up some of your dal to go with it! ND: Your description of Sri Lanka payasam sounds really good. I think even in South India there are so many different variations which use some of the same ingredients you mentioned. So I’m really curious – what are Kenyan chapatis like? Let me know how the dal turns out!